A horrific storm passed through our town producing 1 tornado and one potential, with hail, non stop downpours, lightening,high winds and damage. It lasted two days. The second day on going to my car I noticed some odd looking leaves in two piles in some yard raking I had done and left to be bagged up once they dried. The Leaves turned out to be baby birds who had landed into the pile rather than surrounding hard ground. They could not lift their heads, so weather beaten and had no feathers to protect them. I gave them an hour survival at the most, but wrapped them in towels for comfort on what I thought was their final minutes. Their nest was found torn apart across the yard. I Had no idea how far they had been carried by winds. Making them as comfortable as I could, I purchased fast, some hummingbird feed with no idea what I was doing, ran home and fed them tiny little drops at a time, bundled them to keep them warm and waited for death to show up. They made it through the night. I knew they were too young to eat solids, so I mixed the HB liquid with a fourth of Pulmocare, a food liquid substitute, loaded with vitamins and calories. The runt was half the size of its sibling and had loose bowels from the moment I picked it up, likely from shock and exposure. I did not overfeed them but worked on just keeping them alive until they got some strength. When they made it through the 3rd day I decided I had best do some research on what to feed them 'just in case'. Found articles stating, use chicken baby food with gravy, etc., and adapted what I had to the recipes. After the third day I dropped the Pulmocare as I sensed it was too strong for their system, but it apparently had helped in fast build up of energy. (remember I used a small amount if you try this! Like a fifth per ratio or less) I was having to force feed the runt as they could not figure out communication on the feeding signals. There was no way to tell what species they were so I had no idea what they lived off of and played a hit and miss game until I found them delighted with raisins which had been soaked, boiled, then put through a screen tea strainer by rubbing the pulp around and then slowly boiling the juice it produced into a fine syrup and added that to the chicken. They acted like children at McDonalds drive through! Loved it, so I hit paydirt: they were fruit feeding birds, berrys it seemed. Yesterday I learned that birds will produce feathers almost over night. Wow. Watched it happen right before my eyes. 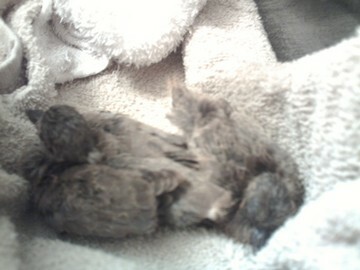 Now they are covered in feathers and doing well. I am still amazed. I do not recommend this to anyone as yes, it takes enormous commitment and hope. Will they live to fly off? I still do not give them great odds, but if they can make it to that stage and can fend for themselves they may actually make it out there. I know the faster I can get them hunting for their own food the better their chances are. The runt apparently was in trouble from birth, and its aggressive sibling likely took all the food so its behind dramatically in development. That one will likely be turned over to professionals but the other is already trying its wings and if all goes well will make it with fingers crossed. The runt is cute as it actually likes to be held, which I suspect is because the warm hand reminds it of a parent nesting over it. It will snuggle down and almost sigh into sleep. I keep a cover towel for that one in the box and tuck it in, while the other prefers no covering. I also make sure they go outside so they can remember what the wild is and hear other birds as well as letting them get sunlight for vitamin D.
Constant watching over them is a must outside. Comments for No Hope - HOPE! If you are right I am delighted as wild doves are my absolute favorite. It would reason as we have many wild doves in the Town, and the growth spurt of feathers was amazing. You could see it happen before you. The runt was not so profound, and I do not think that one would make it out there as its growth seems depressed. It will copy however its sibling so that helps it with preening, feeding, etc., Any further inputs are welcome and needed on what they eat and how long before introducing food on their own. I can not believe a neighbor actually wanted to buy them! Not going to happen! I am just a stop over, not an owner as these birds must exist in the wild if possible. The faster I can release them the better they will be. Just from the picture that you submitted it looks like the baby dove that nested in front of my shop. You will be able to tell very soon though because they grow so fast. You are to be commended for taking such good care of them.